Spicy Maple Glazed Salmon for two makes the perfect weeknight dinner. 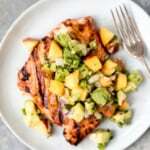 All you need is 20 minutes to make this healthy meal. 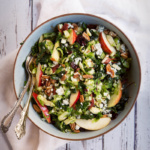 Serve with sweet potato fries and veggies, or a lovely kale and brussels sprouts salad! I’m trying to settle back into the routine of things at home after a little over a week in Israel. It’s going to take me a while to sum up the incredible experiences I had there, but I’ll preface it by saying that was truly a life changing experience. While I’m definitely sleep-deprived, my soul feels peaceful and happy. Over the next few weeks, my plan is to break down my trip by experience and through recipes I enjoyed while abroad. In the meantime, I’ve got some tasty easy meals coming for you because I know how hectic the holiday season gets. After a long day at work and feeling the chill as the winter months approach, the last thing you want to do is cook. That’s why I’m determined to bring you easy 30 minute meals and snacks. And Thanksgiving meals too. I’ve got those coming for you shortly! If you have any last minute requests, I’m all ears. If you haven’t made salmon before, then I suggest you try to incorporate it into your diet more. You might already know this, but it’s a wonderful source of healthy fats, omega-3, and protein. For the longest time, we didn’t eat salmon much, but ever since we made my blackened salmon tacos last year, I’ve been going crazy with easy salmon recipes. And I’ve noticed such a difference in the look and feel of my skin. What I really love about salmon is that it feels like a fancy date night meal. 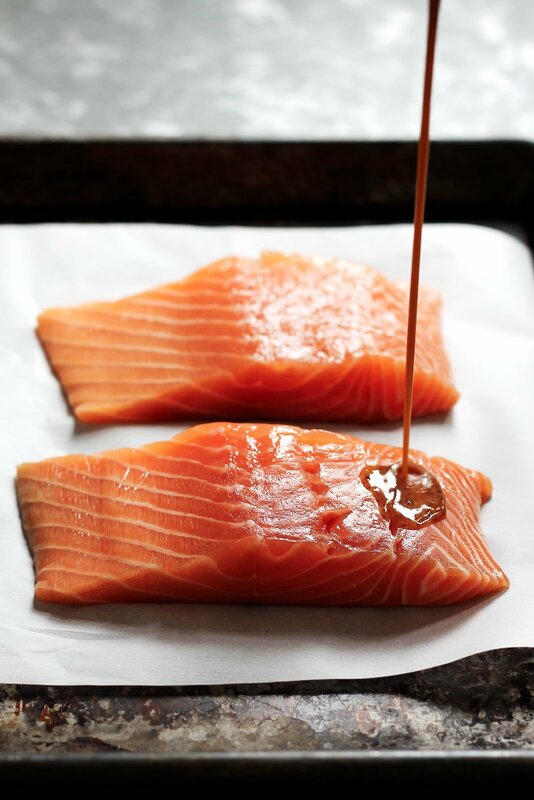 In reality, salmon takes about 20 minutes to bake, and can be seasoned or marinated in whatever your heart desires. 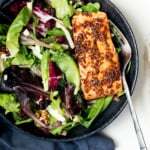 This spicy maple salmon is FABULOUS because it is both sweet and a little bit spicy. There’s also a little tang from dijon mustard and soy, which helps bring all of the flavors together beautifully. This recipe serves two, but you could double it if you’d like. 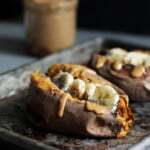 I love serving it with my brussels sprouts and kale salad, but homemade sweet potato fries would also be delish. Hope you guys love this easy Maple Glazed Salmon. xo! 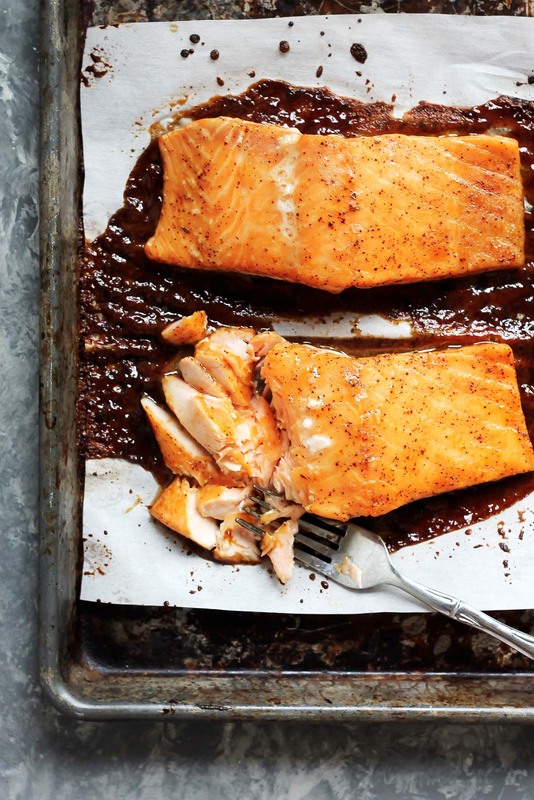 Spicy Glazed Maple Salmon for two makes the perfect weeknight dinner. All you need is 20 minutes to make this healthy meal. 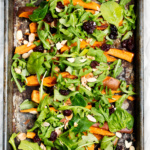 Serve with sweet potato fries and veggies, or a lovely kale and brussels sprouts salad! 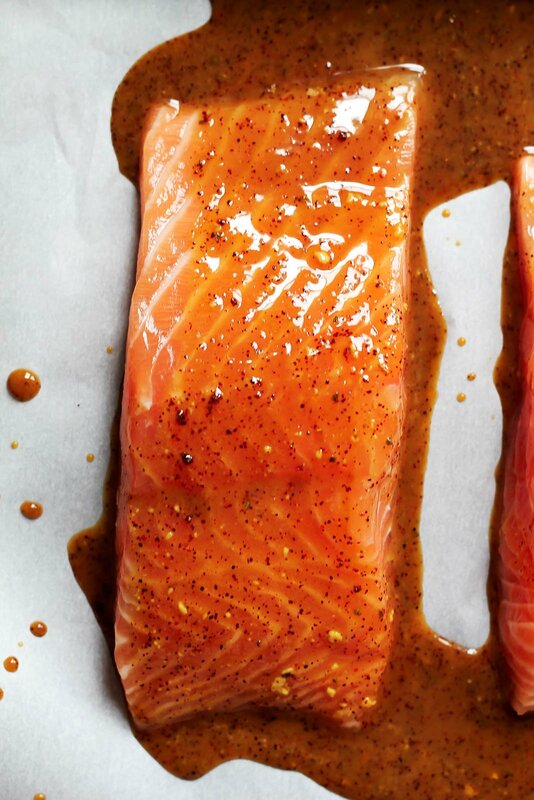 42 Responses to "Spicy Maple Glazed Salmon for Two!" This sounds delicious! Now I just need to get my boyfriend to like fish 😉 He will learn some day lol. Perfect timing! 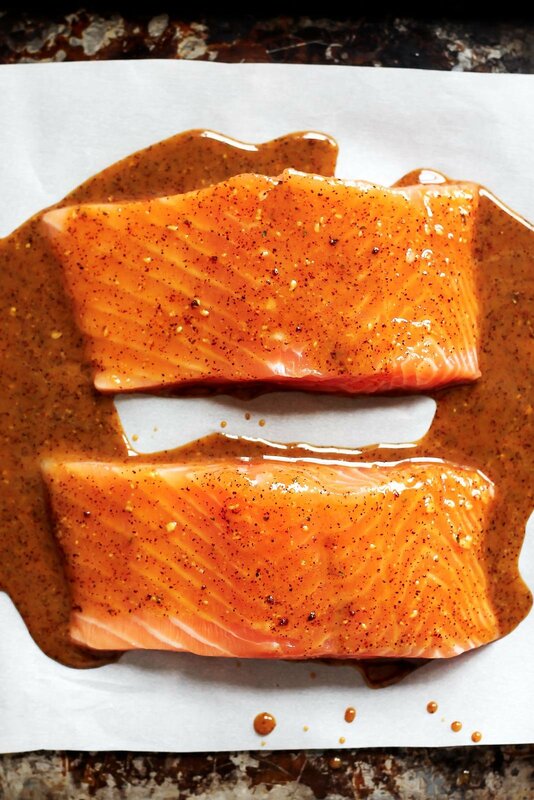 Salmon is on the menu for dinner tonight and I was just looking on Pinterest for a different glaze to try…..thanks! This sounds delicious and seems super easy. I can always use new ways to cook salmon! YUM! Salmon is my fave! This spicy maple glaze sounds incredible! I love salmon, so this will definitely be on my dinner menu soon! I can’t wait to read about your experiences in Israel. It has long been somewhere I’ve wanted to go and, for now, I will live vicariously through your travels. 🙂 As for the salmon – right up my alley! Yum!! I usually do something similar with honey instead of maple:) Maple would be a fun and delicious variation! Fish in general makes the best weeknight meals – so so fast! This recipe is making me want to bake up some salmon this week!! Tried this last night and it was a hit! My husband can be a bit hesitant about fish, but gave it enthusiastic approval. It’s a definite future repeat. Made this last night! It was my first time cooking salmon and it came out perfectly and it was delicious! I made it just for myself and ate the second piece for lunch. Literally the easiest and yummiest recipe. I will definitely be eating a lot more salmon in the new year! So happy you enjoyed it, Britt! Do a TON of salmon here at the casa in North Texas. The spouse is a transplanted east coast person and VERY fussy about how her salmon is prepared. I suspect this will be an awesome add to the repetoire, especially when paired with sesame roast asparagus. My first date with her I made the WORST asparagus ever – we still laugh about it and it inspired a lifelong mission to make asparagus that makes up for that date. Thanks for sharing! Got anything intriguing to share on the key lime pie front? 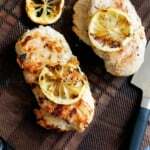 My husband and I both LOVE this marinade; I’m printing it out for safe keeping 🙂 So great too that it just uses normal pantry items so it’s easy to whip up when we don’t have anything planned. You can cook it with the skin on for extra moisture! Shazam, as one who loves to cook and absolutely LOVES salmon, no matter how it is prepared, and try to cook it once a week, this will definitely be served and enjoyed very soon. 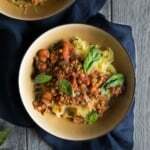 So tasty, and so wonderfully easy! I had this with Brussels sprouts sauteed in butter and soy sauce, and sweet potato fries. I usually do salmon as a weekend night dinner because I’ve always considered it to be “fancier,” but really I could easily whip this up on a weeknight much more quickly than some of the other dishes I make. I have yet to be disappointed by any of your salmon recipes! Perfect! Salmon is one of those “fancy” feeling dinners that are actually super easy 🙂 So glad you’re loving them! Is there anything that you recommend in replacement of the soy sauce? You could use coconut aminos instead! Tried with Tofu was quite tasty. Wish I could pin this recipe (Pinterest) and save it for later, but your website is blocking pin accessibility. Hi Lindsay – we’re working on a fix for the Pinterest buttons. Apologies for the inconvenience and thank you for your patience! I find the skin very off-putting. I have never cooked salmon. Will the salmon be dry if I use skinless salmon? Is there a way to prevent that ? Hi Jenn! Thanks so much for your note. I’m so happy you found AK! Hope you find some new recipes that you love (promise they’ll all be delicious first, healthy second 😉 ).